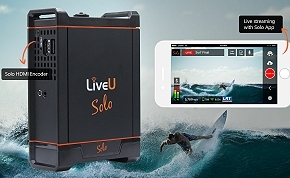 LiveU extends line of Solo live streaming video encoders. IBC, Amsterdam, Stand 3.B62, September 2017: LiveU is extending its Solo product line of professional-grade wireless video encoders to accommodate the growing needs of online content creators streaming to social media and other online destinations. The full product-line will be on display at IBC2017 (stand 3.B62). The enhanced portfolio offers Solo customers an affordable, easy to use, single interface to produce flawless online productions by adding features such as real-time graphics. Solo HDMI encoder – at $995, Solo HDMI version offers a lower priced and flexible option for portable and reliable live online coverage. This complements the award-winning SDI/HDMI Solo, priced at $1495. Solo Studio – featuring innovative cloud graphics for the dynamic branding of content, including titles, logos, and scores. Solo app (iOS) – the simplest way to get started with live content, combining cellular and Wi-Fi connections for more reliable streaming than smartphones. The LiveU Solo portal user interface, accessible on any web-enabled device, has also been upgraded and offers a more intuitive and streamlined workflow helping Solo customers to navigate and complete tasks easily, such as Facebook Live scheduling. LiveU Solo is the streaming solution of choice for leading online and social media content creators. Solo offers one-touch streaming to Facebook Live and YouTube, as well as other popular social media networks and online channels. Leveraging LiveU’s unique video transmission method, LRT™ (LiveU Reliable Transport), Solo allows users to deliver rock-solid content in practically every scenario – on the move and in remote or crowded locations.